Yesterdays Charm With Updated Amenities. 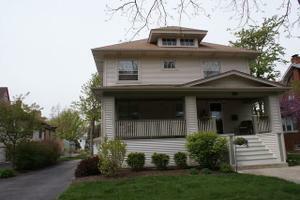 This Lovely Home Has It All....Oak Trim, Moldings, Stained Glass and Hdwd Flooring Thru-Out. Inviting Front Porch, Gas Fireplace, Formal Dr. Updated Kitchen With 42"Maple Cabinets and Butlers Pantry. 4 Generous Sizes Bedrooms On Second Level With Full Bath (Claw Tub). Finished Walk-Out Basement. Beautifully Landscaped. Steps To Berens Park, Train and Town. A Must See Home!! !